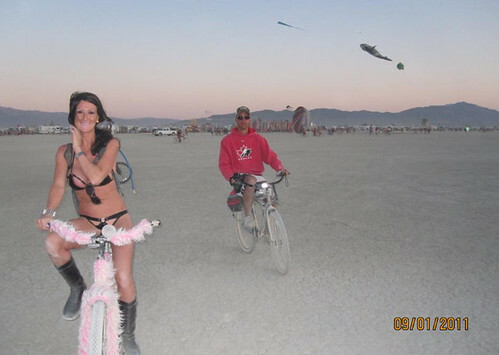 When Cycle Chic can't make it to the Burning Man festival, we send family members to experience it for us. Well, this is a bit of a departure from the usual. I never would have guessed that the typical Canadian hockey-dude (or classic hoser) look, complete with ball cap and sport sunglasses, would show up on a style blog! We Canadians can sometimes give Americans a bit of competition for worst-dressed-nation status. Pink bike with green bikini in the desert, however, is a good look.